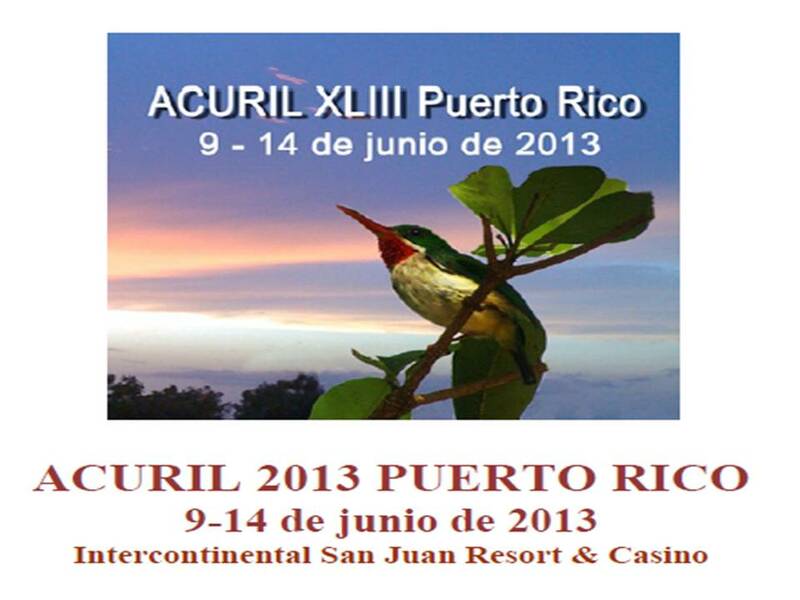 The President of the Association of Caribbean University, Research, and Institutional Libraries (ACURIL), Mrs. Cindy Jiménez-Vera, cordially invites you to submit your abstract paper, workshop or poster, for the forthcoming conference to be held in San Juan, Puerto Rico, 9-14 June 2013, at the InterContinental San Juan Resort & Casino. This Call for Paper, Workshops and Posters, to be presented at the Conference, is open to all information specialists including librarians, archivists, record administrators, museologists and educators in the field of information science, as well as information providers. The theme of this year’s conference is KNOWLEDGE TERRITORIES: Exploring Commons Environments for Learning, Research, Creativity and Productivity in Libraries, Archives and Museums in the Caribbean. It is beingobserved that different types of libraries, archives and museums, from several parts of the world, are changing their environments and services to cater to the needs and expectations of their diverse clienteles. The Commons philosophy, which leads to the design of different environments to satisfy diverse user needs, appears to be propitious to stimulate individual and collaborative endeavors to the exploration and creation of knowledge, and to provide a space to let the imagination and creativity grow. This conference is also designed to provide the spirit of Ubuntu, in order to closely explore the Commons philosophy, its application in our Caribbean information units, and to provide the strategies and tools for best practices. It is our hope that the knowledge acquired from the lectures, workshops, poster sessions, among many other professional development activities in this Acurilean learning and practice community, will keep positioning our Caribbean information units in the frame of avant-garde international librarianship. Paper contributions to the program therefore can either have the purpose of knowledge dissemination and discussion (panel) or have the purpose of knowledge development; and/or skills training (workshop). In our effort to increase professional development for ACURIL members and members of affiliated library associations, we welcome workshop proposals that could count as Continuing Education (CE) credit. In addition, we are circulating a Call for poster sessions to showcase projects and research in relation to the conference theme. Second, to examine together the possible effective implementation and development of Commonsvariants, in our different Knowledge Territories, using the evidence-based practice of the information professional. The space to be provided for dialogue and collective discussion, will allow us to identify and evaluated different ways to approach the paradigm, designs, tools, action plans, required training of personnel, aiming to consider ways in which to adopt new environments within our libraries, archives, museums and other information units, as Knowledge Territories, within our Caribbean region. This joint action will allow our libraries, archives and museums personnel to re-evaluate, refurbish, and stengthen its bases, within theoretical and practical frameworks, with evidences to support effective actions and, therefore, to be able to share the experiences in the region and in other international forums. In order to achieve these objectives, the Conference will focus the following special themes, specifically related to the Knowledge Territories, that we identify as Libraries, Archives, and Museums, integrating variants of the Commons paradigm. Special Theme I. Knowledge Territories integrating the concept of Commons: Theory and Practice. Definition and development of the concept. Types of Commons in action and Critical evaluation: Information Commons, Learning Commons, Research Commons, iCommons, iKnowledge Commons. Which are the possibilities for our Knowledge Territories in the Caribbean? Special Theme II. Trends in physical spaces within the Knowledge Territories in the Caribbean, with the Commons integration; Observe variants, imagine, question, explore, think, design, reflect, share ideas, reconsider, redesign, create, reshare and celebrate. Special Theme III. Elaborate a strategic plan for the implementation and development of a Knowledge Territory in the Caribbean, integrating a Commons variant, using the evidence-based practice for information professionals framework. Special Theme IV. Training and profesional development of the personnel in the Knowledge Territory in the Caribbean, integrating the Commons concept. Special Theme V. Knowledge Territories with Hybrid Commons in the Caribbean: Redefinition of user needs, on-site and virtual services, the strategic plan for development and evaluation, focusing and anticipating the diversity of interests nad preferences in the 21st Century, within our Caribbean basin. Participants are requested, first, to submit an abstract. Following acceptance of the abstract, authors are requested to submit a full paper. Kindly see deadlines. All submissions will be reviewed by the ACURIL XLIII Program Committee and external reviewers. Papers will be both presented during the conference and distributed electronically to the conference participants. Abstracts will be printed in the Conference Program. Abstracts and papers should be in one of the three official ACURIL languages, being English, Spanish, or French. The abstract should be explicit about relevance to the (sub)theme, the workshop/presentation objective, target group and format. Papers should be double-spaced, Times New Roman 12 point. Citations should use the 6th ed., of the American Psychological Association (APA) style manual. All abstracts and papers should include: title, name of presenter(s), employer and/or institutional affiliation, mailing address(es), e-mail address and telephone number. We are exploring the possibility of having a special journal issue or edited book with papers from the conference; hence, the emphasis on formal and uniformity in papers. Should you have any questions about your submission of conference papers and workshops, kindly contact us. Kindly reproduce and distribute copies of this document to other interested persons. Apreciaremos reproduzca y distribuya copias de este documento a personas interesadas. Veuillez communiquer des copies de cette document a d’autres personnes intéressées.